Phasing is the task or process of assigning alleles (the As, Cs, Ts and Gs) to the paternal and maternal chromosomes. The term is usually applied to types of DNA that recombine, such as autosomal DNA or the X-chromosome. Phasing can help to determine whether matches are on the paternal side or the maternal side, on both sides or on neither side. Phasing can also help with the process of chromosome mapping – assigning segments to specific ancestors. The use of phased data reduces the number of false positive matches, particularly for smaller segments under 15 centiMorgans (cMs). In my quest to map the chromosomes of sibling pairs (vs. sibling trios), I turned towards phasing kits on GEDmatch earlier this summer. In order to use this technique, at least one parent must have been DNA tested. Since both my parents have tested for me, I was able to use their results to create phased kits for my brother and myself. 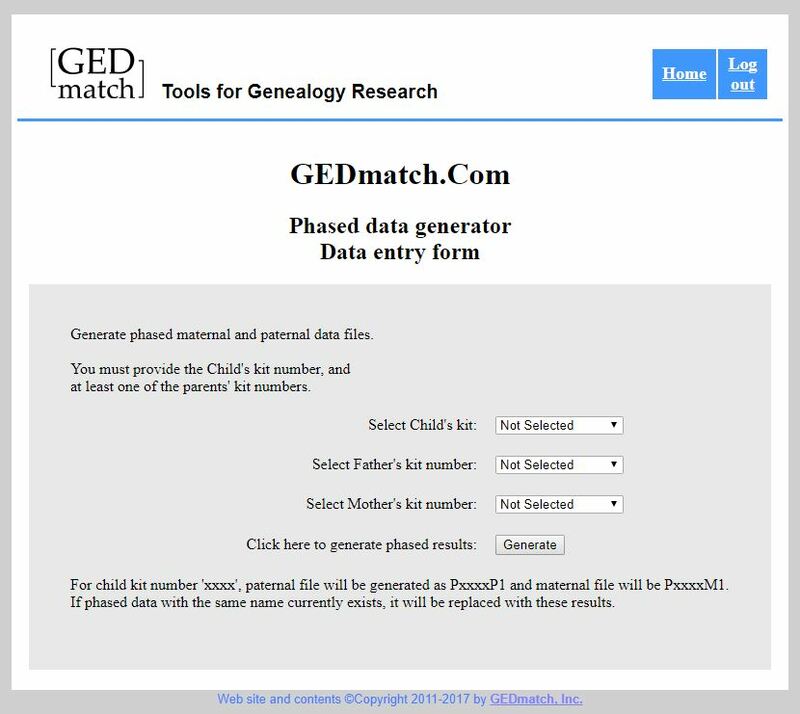 To phase a kit, use the GEDmatch phasing tool. After I created phased kits for my brother and myself, using the one-to-one comparison tool, I compared the maternal kits against one another, and then the paternal kits. As a result, the crossover, or recombination points, for each chromosome are clearly delineated. Because only one chromosome from each pair is being compared, the colors are different from a standard one-to-one comparison. We see purple on the top bar where my brother and I share DNA. Red indicates where no DNA is shared. Likewise, on the bottom bar, dark blue shows where DNA is shared, and grey where it is not. Because the kits are phased, I can see which crossover point belongs to which parent, instead of having to spend the extra time deducing—maternal vs. paternal. Afterwards, I assign the segments based upon collected data from close relatives. Every time I obtain new segment data, I record it in my master spreadsheet. I place only the data from known relatives in this spreadsheet. By known, I mean the lineage is documented and I know where the person fits into my tree. None of this data is speculative. Below are my brother’s and my matches for chromosome 13. We have plenty of good matches on chromosome 13 due to several of our father’s first cousins having tested. Additionally, two close relatives from our maternal side—who share segments on chromosome 13—also tested for me. A sprinkling of third and forth cousins assist in the mapping as well. My brother and I share a segment with my father’s paternal cousin S.Y. I continue with the Yegerlehner segment for much of my paternal chromosome. My brother has a crossover point (31) and can be seen sharing with my father’s maternal cousin J.R. for the bulk of his paternal chromosome. Around the crossover point at 92, I begin to share with some more distant cousins on my paternal grandmother’s line. While at the end of his paternal chromosome my brother crosses over to where he inherited a Yegerlehner/Schiele segment. On the maternal chromosome, my brother and I share part of the McGraw/Kerschner segments. However, I match some New England cousins from my maternal grandmother’s line. I continue to collect data where I can. One thing to remember about mapping (like all genealogy research) is that new data may affect how we interpret all the data. I recently discovered that I had misattributed a segment shared with a 1C1R (and it was throwing off how I had assigned a segment on my map). It was a small segment, and I assumed because he was a known relative it was a real segment. It turned out that once I analysed this segment with my mother’s kit, they did not share this segment at all! So either the small segment I shared with my 1C1R was a false segment (a random alignment of DNA), or we have another common relative on my paternal tree. Happy mapping! This entry was posted in DNA, Genealogy and tagged chromosome mapping, genetic genealogy on October 3, 2017 by Deborah Sweeney. Great question! The crossover point is where the color changes, where one color ends and another begins. I hope that helps.